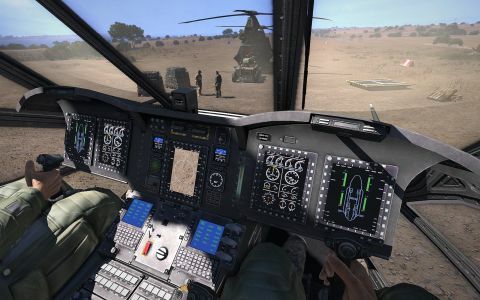 Though its not ambitious enough for die-hard flight sim fans, the Arma 3 Helicopters DLC adds flight sim-style depth to gamings greatest military sandbox. When it launched last year, Arma 3 was a huge, beautiful, empty sandbox. It was an ambitious work-in-progress, lacking essentials like a tutorial or single-player campaign. But Bohemia Interactive’s ethos is that it’s better to shove the big picture out the door now, then circle back around and fill in the details later. Seen in that context, the Helicopters DLC is a logical next step. It adds new mechanics, advanced damage modeling, a detailed flight model, and three new helicopters. The whirlybirds have always been there, of course, in a perfectly serviceable but basic configuration. Now Bohemia has come back, given the textures an upgrade, and added a flight simulator experience. In addition to being challenging fun, the result is a flight sim that offers experiences that no other program can touch. First, let’s talk about how Arma’s helicopters have controlled up to this point. Simply put: the ‘collective’ is the stick that makes a helicopter go up and down, the ‘cyclic’ controls the horizontal direction, and the ‘tail rotor’ spins the bird in place like a top. (That noise you just heard was all the helicopter pilots grunting with disgust.) The computer interprets your actions, meeting you halfway to round you up to a competent pilot. If you release the button raising the collective, for example, the computer assumes you’re trying to get into a hover and adjusts the collective to a neutral position. You and the game are working together to keep the bird in the air where it belongs. Now the training wheels have come off, and the helicopter is a multi-ton hunk of metal desperate to convince itself it’s a bird. The advanced flight model physics are no longer interested in friendly compromise. A mouse and keyboard control scheme is ineffective at dealing with the minute variables of the new model. Keyboard control of the new analog collective is touchy business that leads to splintered landing struts and compressed spines. I flew for this review using the Thrustmaster T.Flight HOTAS X and a TrackIR headset. I think you’d have a pretty tough time without a headtracking peripheral of some kind. Even my bottom-of-the-budget control setup cost north of $160, so there is a notable bar to entry here. It’s easy to see why the founder of the Arma gaming group Shack Tactical told me in August that the group would not be adopting the advanced flight model for its regular play sessions. The loss of accessibility is too high. So the new flight model has more detailed controls, but is the modeling any good? Well, yeah—depending on what you mean by good. To be clear, hours flown in Arma won’t count toward your helicopter pilot’s license. This is not a reality-standard physics simulation. You can move in some ways that real helicopters can’t, ways which other helicopter sims won’t let you get away with. The vortex ring state, a deadly feedback loop of choppy air caused by fast descent, is still not a problem Arma pilots can run into. All of those caveats aside: yes, the physics is great for a flight sim newbie or an Arma pilot looking for the next challenge. I specifically enjoy that the weight of troops and equipment affects my hover threshold, and I can feel the aircraft getting lighter as each heavily equipped soldier hops off. I curse the name of strong ocean crossbreezes, and trying to fly a jeep to a canyon FOB made me sweat like a Sriracha enema. Bohemia has added two new mechanics to play with that will benefit all players. Being able to fire a personal weapon from vehicles has been the community’s most popular wishlist item, and it has finally arrived. Now any player can shoot a primary weapon, reload, throw grenades, and switch to a sidearm while in any open-facing seat. In practice, this means that the beds of pickups, the running boards of helicopters, and the last seats on troop transports are now hot. As much as I love the new firing-from-vehicles mechanic, its current incarnation is pretty poorly executed. The seat view has been turned into a turret view without a turret, basically, which means that you have a limited arc of fire—about 120 degrees. It’s a restriction that feels weird and artificial. Tactically, each shooter should pick a direction and cover it, but being unable to turn makes me feel like I’m wearing a rigid back brace. Shooting from the running boards of a helicopter is much more fun and the view restriction, with your back against the aircraft, makes a little more sense. I look forward to seeing video of a sniper popping headshots while on a hovering Littlebird, but I wasn’t a talented enough marksman to make it happen. The other new mechanic is “slingloading”—suspending heavy loads beneath a chopper—which has actually been available as a community-made mod for some time now. The official version is much smoother, though, with nicely animated rigging ropes and fluid-body physics allowing crates to swing up and out as I change direction. Perhaps my favorite part of this DLC is the improved helicopter damage modeling, which makes even extreme crashes much more survivable. Clipping a tree or lightpole with your main rotor will snap it off—previous incarnations of this damage model simply made you explode. High-speed runner landings are also possible now (again: previously, you’d just explode), which makes losing the tail rotor is now one emergency landing away from an awesome story. For large-scale multiplayer operations, having a damaged helicopter and stranded flight crew is mechanically much more interesting than a fireball and a respawn. Rescue missions can now happen organically, wherever and whenever a pilot makes a whoopsie. The damage model needs one big improvement, however: being upside-down causes an instant explosion. Surviving a crash landing only to slowly tip over and detonate is frustrating and ridiculous, as though Arma is set not in the near future, but on the set of a 1980s action movie. For all the ways that helicopters have become more robust and realistic in this DLC, this specific fragility is really annoying. Three new helicopters have been added to the game. The smallest, the M900, is a barebones civilian version of the AH-9 Littlebird, and doesn’t really add much to the game. It’s light and has quick controls that might be a good way to introduce a new pilot to the advanced flight model, but I didn’t feel much of a difference between the M900 and the AH-9. If anything, I think it may be a nod to Bohemia’s game Take On Helicopters, which ran on a version of the advanced flight model back in 2011. The two new heavy lifters are much more interesting. Blufor’s new CH-67 Huron is a pretty standard take on the dual-rotor Chinook, but the cockpit interior is gorgeous and it can carry two full weapons squads and a fully loaded jeep anywhere on the map. Opfor’s new Mi-290 Taru is my favorite addition. The Taru is a humpbacked heavy lifter with a modular cargo area, with variants for troops, medical supplies, ammo crates, and a few others. With proper application, it can get a mobile headquarters, hospital, or repair depot anywhere in the map in a few minutes. The new choppers are part of the premium DLC package, but anyone can use them if they’re willing to put up with a pop-up ad and a little icon reminding you, somewhat passive-aggressively, that you’re in a thing that you should have paid for. I can’t fault Bohemia for including the reminder, though, as it’s a good way for them to get paid without fracturing the playerbase between helo fans and everyone else. The advanced flight model, slingloading, and firing from vehicles all work with the original helicopter fleet without pestering, which makes this paid DLC a generous free update in disguise. This isn’t the most high-fidelity helicopter flight sim on the market, and it doesn’t pretend to be. That’s not what it’s for. Think of this update as a way to add a big helping of that flight sim flavor into the rich Arma playground. It gives up some sparkle when it compromises on some aspect of flight physics or aerodynamic minutiae that Flight Simulator X or DCS models correctly, sure. But Arma’s high-res ground model, civilian infrastructure, and infantry integration make the Helicopters DLC perhaps the greatest flight sim in terms of accessibility and context. In that respect, it’s a huge success.